Edition Statement Bilingual Edition, English & Spanish ed. 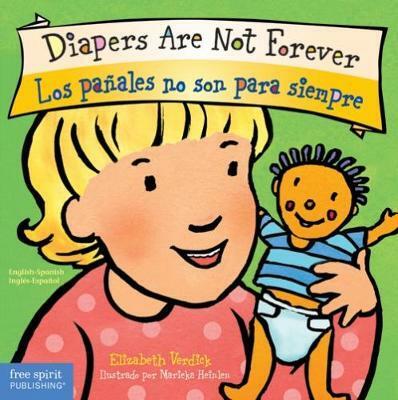 Elizabeth Verdick is the author of more than forty highly acclaimed books for children and teenagers, including books in the Happy Healthy Baby(TM) and Toddler Tools(R) board book series, the Best Behavior series for young children, and the Laugh & Learn(TM) series for preteens. Her most recent titles include "Reach" (Happy Healthy Baby), "On-the-Go Time" (Toddler Tools), "Bystander Power" (Laugh & Learn), and "The Survival Guide for Kids with Autism Spectrum Disorders (And Their Parents)." She lives with her husband, two children, and five pets near St. Paul, Minnesota.Marieka Heinlen received her BFA at the University of Wisconsin, Madison, and also studied at Central Saint Martins College of Art and Design in London. She launched her career as an award-winning children's book illustrator with "Hands Are Not for Hitting" and has illustrated all of the books in the Best Behavior and Toddler Tools series. Marieka focuses her work on books and other materials for children, teens, parents, and teachers. She lives in St. Paul, Minnesota, with her husband, son, and daughter.